What an action packed three days this conference will offer to those that book. There will be a total of 6 workshops and two Keynote speakers. There will be a total of 12 speech contests; 8 Semi-finals and 4 finals. There will be a Candidate Showcase where those running for District office will be asked a series of questions, so you will know them better. The District Council meeting will be on Saturday where our new District officers will be elected, and any motions will be voted on. There will be entertainment each evening and a lot of food. So, the question is…. What are you waiting for? Come, see and hear great speakers at our eight semi-finals and four finals of the Humorous Speech, International Speech, Table Topics and Evaluation Contests. All the semi-finals will be held on Friday the 10th May. The finals of the International Speech and the Table Topics Contest will be held Saturday 11th May, and the finals of the Humorous Speech and Evaluation Contests will be Sunday 12th May. What does Norwich, 1940s, May 2019, fun, educational and yourself all have in common? If you guessed the 2019 Norwich Conference you would be 100% correct. I am getting excited that we are only five (5) months away from what will be a fantastic and history making conference. Fantastic? You bet. We will have two outstanding Key note speakers. Eldonna Lewis Fernandez, Accredited Speaker, Toastmasters International will be visiting us from the United States. Eldonna speaks all over the world and we are fortunate to have her come to Norwich for her Keynote and will also be presenting a workshop. Our own Marcus Hemsley is our second Keynote speaker from Norwich. Marcus is the Founder of a Strategic Digital Marketing company, Fountain. Marcus has worked with many well-known companies but also enjoys working with start-up companies as well. Fountain has been awarded two prominent awards in 2017; Growing Businesses Online Award for Europe, Middle East, and Africa. Four weeks later, Fountain was a Global Google award winner. He will be presenting both a keynote and a workshop, so we are very fortunate to have Marcus at our conference. History Making? You bet. For the first time in our history, we will be holding eight (8) Semi Finals and four (4) finals Speech competitions at one conference. Please come along and support your Division Contestant in each of the Semi Finals and for those lucky enough to make it to the final, they will need your support to help them win!! Please go to https://www.norwichconference2019.com for more information and to book your place. Looking forward to seeing old friends and making new. If you have any questions, please email info@norwichconference2019.com. Are you interested in serving as a District Leader for the Toastmaster year 2019-2020? Serving as a District Leader is a wonderful opportunity to further develop your communication and leadership skills. Leadership roles can be challenging, but mostly they are rewarding, and they are always a learning opportunity. For further information about these roles, please refer to the District Leadership Handbook and the District Administrative Bylaws, Article VII: Officers in the Toastmasters International Governing Documents. See the Toastmasters International Website for the Elections Toolkit. Our 2019 Toastmasters Conference will be held at the Holiday Inn, Norwich from the 10th to the 12th May 2019. In keeping, the theme of the Conference is the 1940’s so there’s plenty of scope for the Friday evening fancy dress. Come and hear the four District Speech Finals and Keynote speaker – Eldonna Lewis Fernandez. 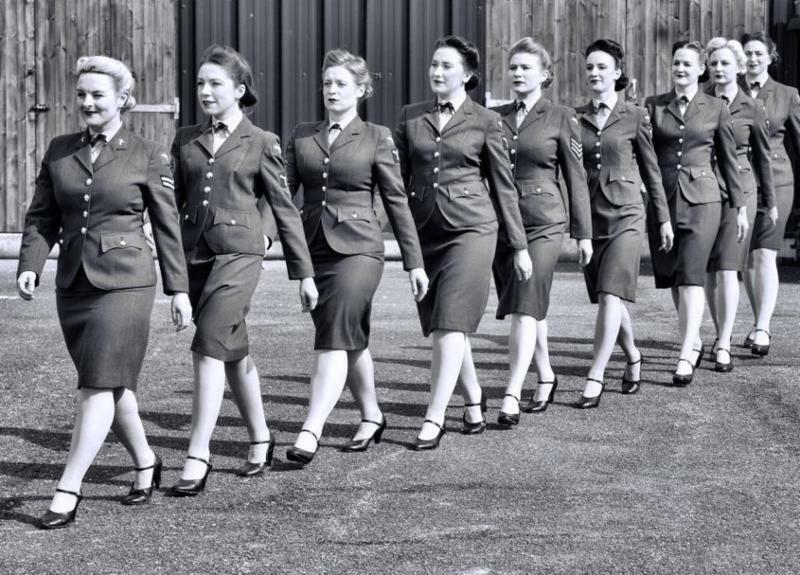 Entertainment will be provided by the D-Day Darlings from Britain’s Got Talent and the Joe Ringer Band. There will be educational workshops, the District Council Meeting and much, much more. There’s also lots to see in and around Norwich so why not make a holiday of it and think about booking now. Go on to https://www.norwichconference2019.com/ for more information and to book. May the newsletter be with you! Posted on May 31, 2018 by Laura Bruce in Conference, Distinguished Club Program, District 71 Council, New clubs | Comments Off on May the newsletter be with you! Herewith, the D71 May newsletter! All the news from the SafeHaven 2019 conference, news from the District Council meeting, and most of all, lots of updates from our feature division this month, Division A. Division A Director Ted Mellamphy has put together a bumper issue, and I am sure you will enjoy! Let me know what you think — your feedback is always welcomed. PS Here’s some photos from the conference to whet your appetite for Norwich in 2019! Eric Fitzpatrick from Division C came second in the Evaluation Contest. From left: Anne Dooley, 2nd place; John Duncan, 3rd place, and winner of the International Speech Contest, Deirdre Linehan. Gerard Mannix was elected Club Growth Director. Daniel Sandars was elected Public Relations Manager. Division A: Maura Meeney was acclaimed. Division B: Larry Lyons was acclaimed. Division C: Barry Lane was acclaimed. Division D: Shaun Durkin was acclaimed. Division E: Andy Nichols was acclaimed. Division F: Pat Croke was elected. Division G: Alex Knibbs was acclaimed. Division H: Steve Campion was elected. Division S: Avril Stringer was acclaimed. Their term will commence 1st July 2018. The Realignment Committee’s recommendations for new boundaries was approved. On the motion for future contests, Option 3 was approved: all 4 contests will be held at District Conference each year. Motion: From 1 July 2018, Area Directors in District 71 will be appointed by the District Director through a nominations committee: the motion was defeated. 18 Clubs have already achieved President’s Distringuished Status. There are 22 DTMs this year, and 22 members have achieved a Triple Crown. Killarney will host the 2020 District 71 Conference. Contestants’ Briefing has been moved to Harbour 10. We have been delighted to host Region 11 Advisor Aletta Rochat in District 71 for the past week. Division Directors Robert Brooke and Daniel Sandars in Divisions G and H created a jam-packed itinerary. In total, Aletta attended nearly than a dozen District 71 events! At the majority of these, Aletta led a workshop, so she’s been very busy to say the least! We’re delighted that Region 11 Director Aletta Rochat will be visiting us next week. Based in Cape Town, South Africa, Aletta will spend a week in D71. She’ll be visiting clubs and giving presentations to a range of audiences across Division H. After a hectic week, she’ll join the District Leadership Team for training in Manchester at the weekend. Among her stops will be the 15th Anniversary celebrations of Anglia Communicators on Monday 23rd January. An auspicious occasion indeed, Aletta’s presence will be the icing on the cake for this Peterborough, England club. There, she’ll lead a workshop, “How to Prepare a Great Speech when you have NO time to prepare” . While we’re only at the halfway point of the Toastmasters year, the end of December marks the end of the calendar year. It’s a wonderful time to spend with friends and family, and also to reflect on the year that has been. Whether this is your first year or your thirtieth, I hope you feel that this year in Toastmasters has given you not just new skills and confidence but also the joy of camaraderie, new friendships, and a feeling of being a part of something positive. Looking ahead, I hope you will continue to find benefit in your involvement in Toastmasters, and continue to grow and develop both your public speaking as well as your leadership skills. On behalf of the entire District Leadership Team, I wish you a very merry Christmas, and a healthy, happy and successful 2018.